Central venous catheters are placed in neonates and infants for fluid or medication administration, hemodialysis, parenteral nutrition, or administration of intravenous antibiotics over a prolonged period of time. It can be a difficult process to perform and is not without risk to the newborn patient. through which the catheter is placed. A technique using a single needlestick to place a tunneled central venous catheter in the jugular vein is being advocated for these fragile patients to preserve upper extremity veins, to avoid femoral vein placement, and to potentially reduce the risk of venous thrombosis. This technique has now been validated as safe and technically feasible by interventional radiologists at three leading pediatric hospitals, who reported their experiences in Pediatric Radiology. The use of a single incision to place a tunneled catheter was first reported in 2007, in 12 patients at the Aurora Baycare Medical Center in Green Bay, WI.1 The technique avoids making a separate incision to access the vein and the tunnel exit site. Under ultrasound guidance, a long, curved needle is used to make a subcutaneous tunnel and enter the vein. Using a jugular vein instead of a femoral vein results in less risk of infection by avoiding the diaper area. The authors describe the procedure they performed in depth in the Pediatric Radiology article, which includes photographs of the equipment and its placement. Pediatric interventional radiologists at Children’s Healthcare of Atlanta; Lucile Packard Children’s Hospital in Stanford, CA; and Seattle Children’s Hospital conducted a study of all neonates and infants who had a single-stick tunneled central venous access procedure in either the jugular or femoral veins between March 2014 and September 2016, and weighed less than 5 kg (11 lbs) at the time. The subject group included 33 infants (birth through 367 days) who had a jugular vein procedure and a control group of 41 infants (birth through 163 days) who had a femoral vein procedure. 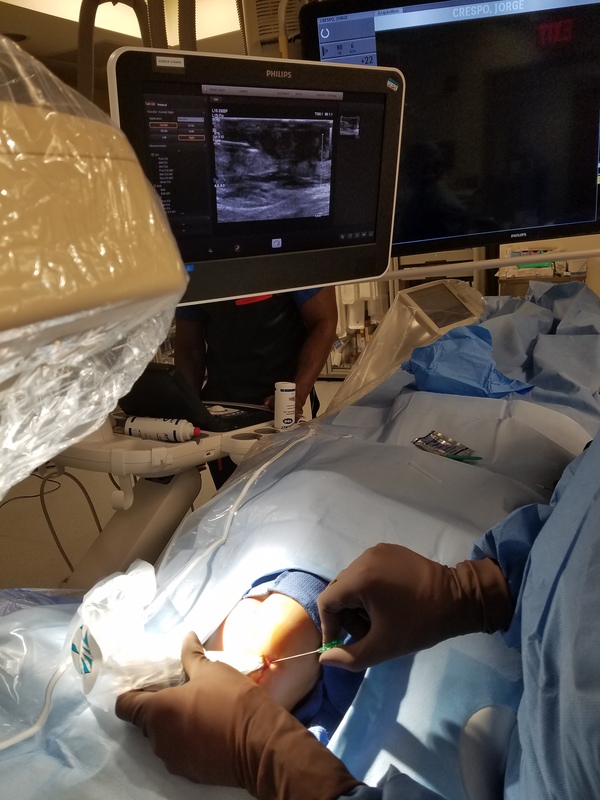 Lead author Will S. Lindquester, MD, of the Division of Interventional Radiology and Image Guided Medicine at Emory University School of Medicine in Atlanta, reported that 91% of the jugular catheters were functional throughout the entire treatment. There were no major procedural complications and only one minor one. No challenges such as decreased maneuverability of the needle and difficulty passing the guide wire were encountered. Only one jugular catheter was removed more than 7 days following its placement, out of concern for infection. Another patient experienced catheter displacement, which was successfully exchanged. A third patient had a catheter accidentally removed during dressing changes. Complication and infection rates were comparable to the control group, and to data from previously published studies. “By theoretically reducing the risks of catheter infection by avoiding the diaper area and thrombosis by using larger veins,” the authors write, “it may be preferable in certain patient populations,” such for whom placement of femoral central lines or PICCs is not preferable. The authors also recommend that additional studies be conducted to evaluate if tunneled jugular venous access reduces the rate of venous thrombosis, chronic venous occlusion, and central line infection. Glenn BJ, Single-incision method for the placement of an implantable chest port or tunneled catheter. J Vasc Interv Radiol. 2007 18:137-140. Lindquester WS, Hawkins CM, Monroe EJ, et al. Single-stick tunneled central venous access using the jugular veins in infants weighing less than 5 kg. Pediat Radiol. 2017 47;12: 1682-1687. Jugular vein single-stick tunneled central venous access feasible for neonates. Appl Radiol.